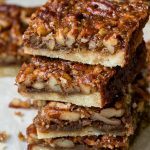 Pecan pie bars are a tasty snack to make for a crowd or whenever you're craving a good old pecan pie but need a shortcut. The bars are made with a tender shortbread crust and a rich, caramel-y filling. If you have it, use powdered sugar instead of granulated sugar for the crust (not the filling), which gives melt-in-your-mouth texture to the crust. Substitute 100g granulated sugar with 100g powdered sugar (3/4 cup plus 2 tablespoons). Preheat oven to 350°F/180°C. Line a 9×13-inch pan with parchment paper, leaving enough overhang on the sides for lifting the bars out of the pan after baking. Set aside. Make the crust: process flour, granulated sugar, and salt in a food processor for a few seconds until combined. Add butter and vanilla extract and pulse until mixture becomes crumbly and resembles coarse meal. Alternatively, you can crumble all the ingredients together in a bowl using a pastry cutter. Press crumbs firmly into prepared baking pan to form a crust. Bake for about 15 minutes, until the edges just start to turn golden brown. Allow to cool for 15 minutes before adding the pecan filling. Make the filling: Heat butter, sugar, and maple syrup together in a saucepan, stirring constantly, until the mixture is boiling and sugar dissolves. Let mixture cool slightly, then whisk in salt, eggs, and vanilla. Add pecans and mix. Pour filling evenly over the crust. Bake for 25-30 minutes until filling is set. Allow to cool on a wire rack, then refrigerate for at least 6 hours before serving so that the filling can set. Lift bars out of the pan using the parchment paper and cut into squares. Store bars in the fridge for up to 1 week.